If you have been following my blog for awhile, you know that I love sweet things. In fact, my Sweet Treats Pinterest Board has over 500 pins in it. 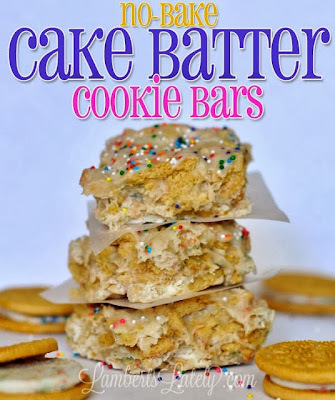 When I saw the No Bake Cookie Batter Bars by Leslie of Lambert's Lately, I knew I had to know more. She shared a recipe that not only looks great for the holidays, but is easy to make too. Sounds like a perfect recipe to me! If you would like to see how to make her No Bake Cake Batter Cookie Bars be sure to see it on Lambert's Lately here. Thanks so much for linking this delicious recipe on Dare to Share Leslie! You are very welcome! Your cookie bars look delcious!